At present, Estonia is the only country that is offering internet voting to the entire electorate. In Estonia’s 2019 parliamentary elections, nearly 44% of the votes were cast online. Online voting offers lot of benefits. Do you think India also should offer internet voting to the entire electorate? Today is the 9th day of ‘Let’s Discuss’ program. For those who are not aware of this program, let me tell you what it is. It’s like a virtual group discussion. we’ll give you a GD topic on every Tuesday. Go to the embedded youtube video and express your thoughts on the topic by tomorrow morning 10 o’ clock. We’ll read each and every comment and we’ll pin the best comment. The aim of this program is to create a platform for students to express their views, to learn from the opinions of others and to finesse their articulation skills. 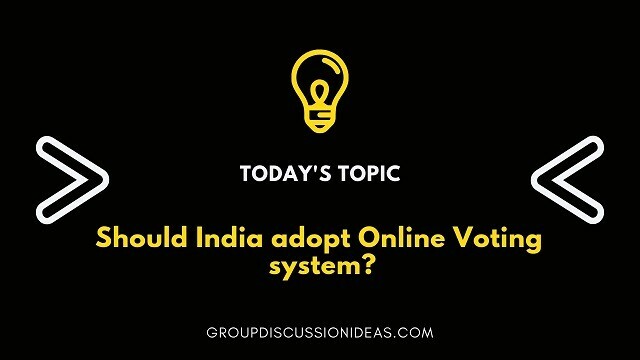 Topic is mentioned in the video (Today’s topic is – Should India adopt online voting system?). I think it is not necessary to adopt online voting system because firstly all India citizen are not having the knowledge to access website link and then vote in this process some one can misuse that person voting power and converts into his option (proxy), secondly government has to take necessary action to protect such website when voting are held it means they has to protect from data loss or overwrite (hacker’s) and lastly a separate server establishment has to be done and to maintain properly with all security measures which cost huge…. I don’t think India should adopt the online voting system as a huge amount of population still doesn’t have basic education to even use internet. if it is made online then the most of the people would be fooled and there votes would be exploited. The people who doesn’t have access to the internet, there votes would be exploited by the political parties for taking undue advantage. so i guess it would be better to educate the people first and to spread the awareness so that this boon is not made a bane. According to me if India adopt online voting system it will be good because of – 1. Election will be free and fare , corruption will be reduced. 2. Election commission does not need to spend lot of money to process the system. 3,. People does not need to go to polling Booth they cam cast their vote to sit in the drawing room ,. We see on the day of vote people gets afraid those sensitive area , many iviolance happens like gun shot ,, bombing , intimidation etc. 4. Lot of manpower will not involved to process the vote.only not for clerical work ,lot of Kolkata police and district police involved for security purpose even call Central forces to maintain peace . There is lot of benefits to adopt online voting but India will adopt it – 1. In India largest populated country though we are living in the 21st century but still many peoples are there theu don’t have education and living below the poverty line so there is no question of online voting system. First govt has to eradicate poverty and illiteracy 100 percent then can adopt online voting system,. 2. India is a Democratic country by the people, of the people and for the people , politicians will not accept it so it will not pass the proposal to the Parliament. Online Voting system is one of the unique idea opened up in recent times. It provides the suitability to cast the vote hassle-free. At present, Estonia is the only country that is offering internet voting to the entire electorate. If India implemented such an idea, it will provide the first mover advantage and being advanced in comparison to other Developed and Developing countries. It saves much of time and energy of everyone and reduction in cost of Government for setting up EVMs and facilities at election booth like deployment of troops. Online Voting can solve many of the problems faced by voters during the voting day. One of the main problem during voting is the long queue that we have to face. But with the coming of Online Voting, this problem can be solved and people can cast their vote from anywhere. Another problem is the pressure from candidate and their parties to caste their vote to them. Also, in some states the voting is done in wrongful manner as voters are asked to go home and their vote would be cast by the candidate party members. This problem was of more concern during the slip-system where voters cast their vote under threat of Candidate party’s member standing beside them with weapons to caste their vote to them otherwise they were beaten. Even sometimes fake votes were cast in name of person who is not alive or not present in country during the elections. To overcome this, EVMs were established and is used at present to stop fake voting. As there left no proof to whom the person has voted. So, Online Voting would help people to cast vote without any threat of party members as here also no valid proof exists. Also, the EC can verify whether the person is dead or alive and also there is no Double voting by same person. But, beside every good thing there are some limitations and so the Online Voting carries. Anyone who knows your credentials can login with it and can cast your vote. Also, the websites can take too much of time to load the page by going heavy during that day because of voting by so many people and can lead to cast vote one time more or failure in voting. One of the biggest problem in India is illiteracy and people casting vote to the person of their area only without knowing their qualifications and suitability for such post. Illiterate and old people can’t cast vote until and unless physical guidance is provided to them during the voting. Even today, after so long the EVMs are used for voting, these people are afraid to cast vote through them. Thus 100% implementation is very difficult in a country like India. Before implementing something new, a detailed study of it should be carried by experts and everything whether it is of less importance or more should be kept in mind. The suitability of People casting Vote is also necessary as they are the one to use these services. Everything should me made in easy way with proper guidance and Demo by video, if possible. Moreover, politicians can appoint hackers to influence the online voting system. 100 percent voting in internet is very difficult to India because there is a problem of illiteracy, our Indian education system calculate a person as he or she was literate even he/she knows only write their individual name so in our country 35 billion people knows internet operating out of 135 billion people but it can be helps those who live out of their constituency..